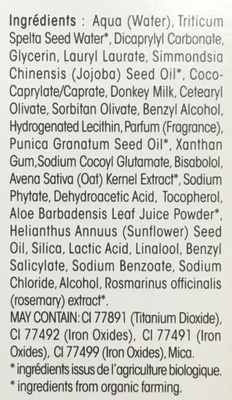 Aqua (Water), Tritium Spelta Seed Water, Dicaprylyl Carbonate, Glycerin, Lauryl Laurate, Simmondsia Chinensis (Jojoba) Seed Oil, Coco-Caprylate/Caprate, Donkey Milk, Cetearyl Olivate, Sorbitan Olivate, Benzyl Alcohol, Hydrogenated Lecithin, Parfum (Fragrance), Punica Granatum Seed Oil, Xanthan Gum, Sodium Cocoyl Glutamate, Bisabolol, Avena Sativa (Oat) Kernel Extract, Sodium Phytate, Dehydroacetic Acid, Tocopherol, Aloe Barbadensis Leaf Juice Powder, Helianthus Annuus (Sunflower) Seed Oil, Silica, Lactic Acid, Linalool, Benzyl Salicylate, Sodium Benzoate, Sodium Chloride, Alcohol, Rosmarinus Officinalis (rosemary) extract. MAY CONTAIN : CI 77891 (Titanium Dioxide), CI 77492 (Iron oxides), CI 77491 (Iron Oxides), CI 77499 (Iron Oxides), Mica. Produit ajouté le 27 février 2016 à 16:43:30 CET par tacite. Dernière modification de la page produit le 29 mars 2019 à 15:57:51 CET par khorkaadren.